There's nothing quite like relaxing on a glorious summer's day, soaking up the afternoon sun under the shade of a patio awning. With a glass of wine in one hand and a good book in the other, you get to enjoy the beautiful views of your garden and the warmth of the sun without fear of burning yourself. Sounds great, doesn't it? This is just one example of why many people across the UK are choosing to install a patio awning on their property. Patio awnings are installed for many reasons. The cover that an awning provides can allow you to expand your living area outdoors, whether it's for the kids to play underneath in the shade or to entertain guests in the evening with a few drinks and a meal outside overlooking your garden. An awning can really transform your home and bring you closer to the outdoors. At Awning Man, we're proud to offer a wide selection of patio awnings for our customers at great prices as well as FREE DELIVERY throughout the UK. With standard, semi casette and full-cassette awnings available, you can choose the size you require and whether you'd prefer a manual or electric awning. We've also a variety of colours to choose from including striped awnings and plain so you can find the perfect match for your home. All of the DIY patio awnings we supply are waterproof which means you can benefit from them even on those rainy days. Can't see what you want? 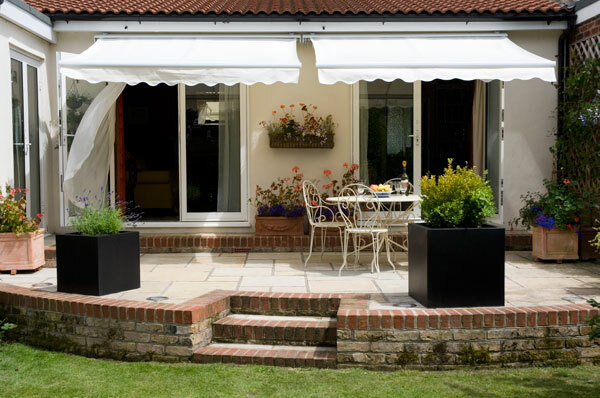 We also offer a bespoke awning service as part of our sister site Sovereign Awnings. Our bespoke awnings are perfect for those who are looking for something specialised for their home or business with sign writing services also available.